In his Letter to Artists Pope John Paul II writes to the people who "are passionately dedicated to the search for new 'epiphanies' of beauty so that through their creative work as artists they may offer these as gifts to the world." Art and beauty have always held a place of significance and esteem in our Catholic faith. Art allows you to peer into the soul of the artist. Look at a painting, a sculpture, listen to a song or witness a playwright's creation on stage and you see something unique that can only be created by that person. Sometimes it's serene, sometimes confusing or full of pain or even full of small imperfections...and yet all of these elements add up to become something beautiful. And in the same way that man-made art reveals a little of the human artist, the beauty of creation, the things that take our breath away, reveal just a little of the goodness of God the Heavenly Artist. And all I can think is Wow, we are so loved. While we may not be the kind of artists Pope John Paul II was talking about in his Letter to Artists. 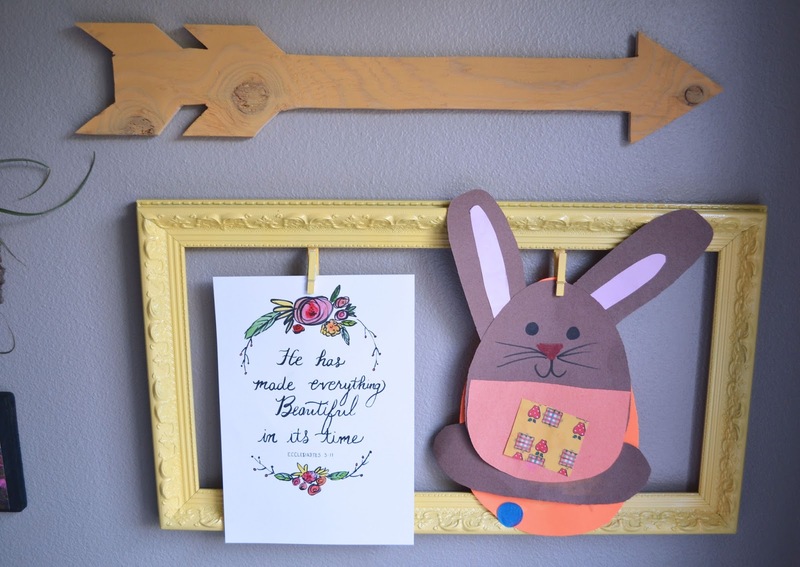 There is still a place for art and an emphasis on making time to create it in our home. 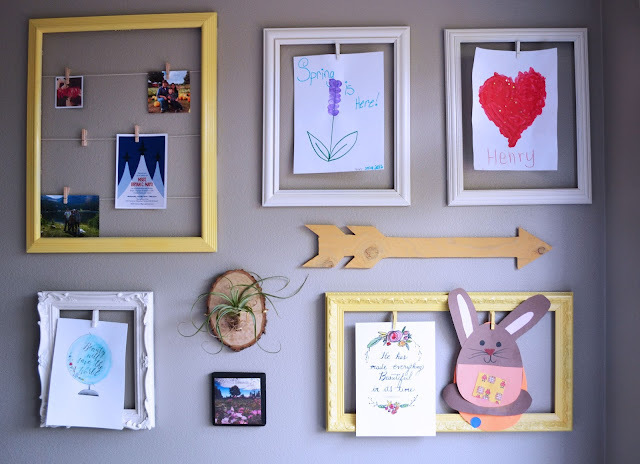 Here is a very simple way to elevate the art created by your family. Take it off the fridge and give it a proper frame! I couldn't bear to repaint the Eiffel Tower picture or frame but the rest got a healthy dose of Primer and Paint. 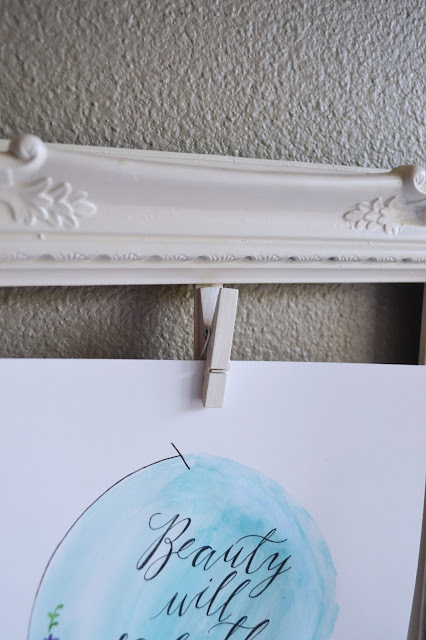 I finally have a place for some of my artwork and hand lettering too! Oh, and Josh made that arrow out of scrap wood and a jigsaw! 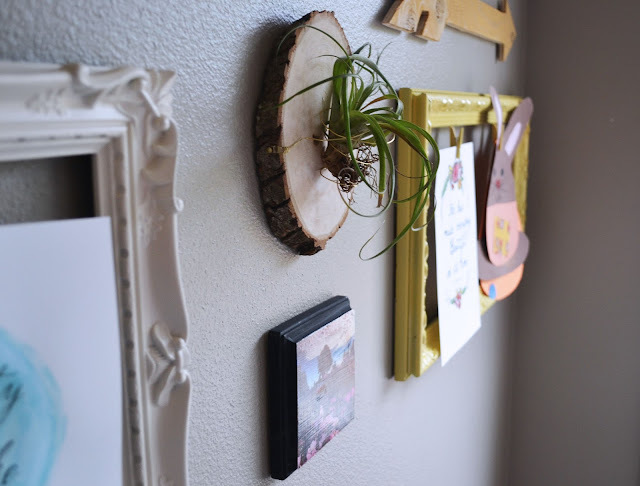 I also made a little holder for an air plant (tutorial will be posted in a few days). A close up of the frame. I hot glued popsicle sticks to the back of the frame and glued small clothespins on top. 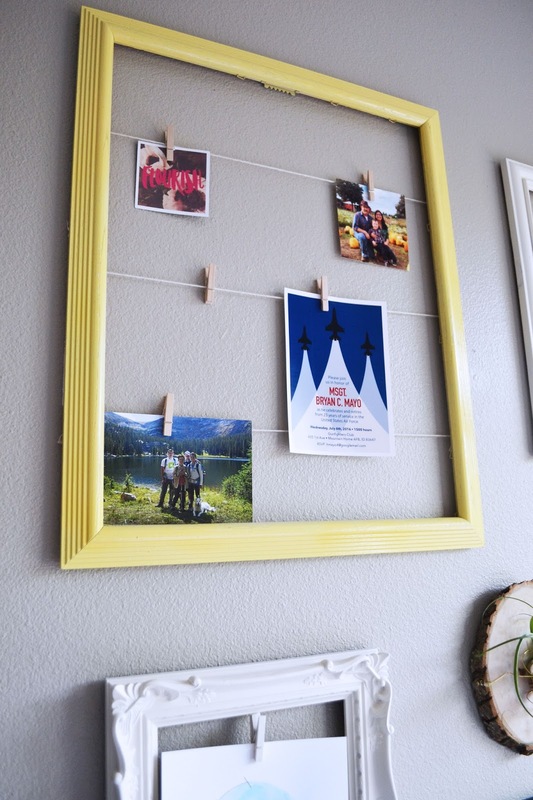 For the yellow picture holder simply use a staple gun to attach cotton twine to the back of a large frame. Clothespins hang freely and can be moved around as you like. I love having this little space for pictures and cute invitations. All of these items simply lived in a stack on my countertops and now they finally have a home! Have questions? Send them my way! Great idea! 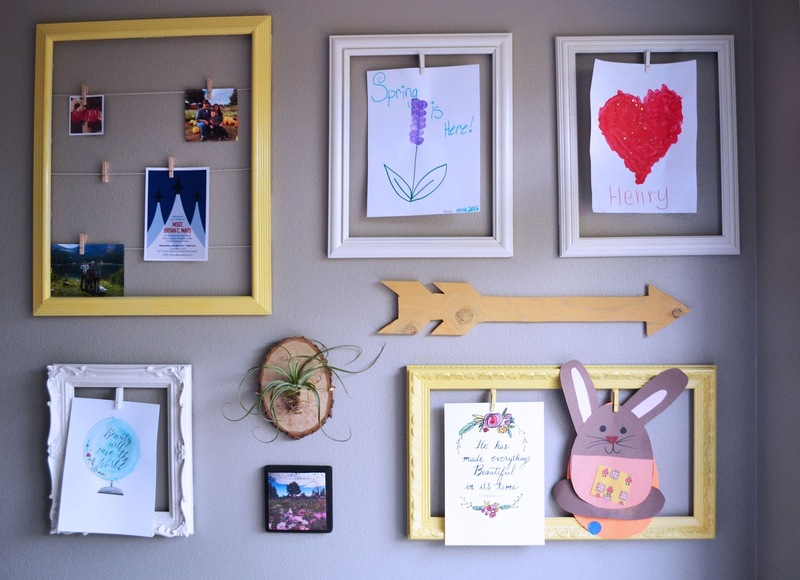 I needed one more piece for our art wall, and the yellow frame with the twine & clothespjns will be perfect. I even have spray paint in the bright idea color! Perfect!